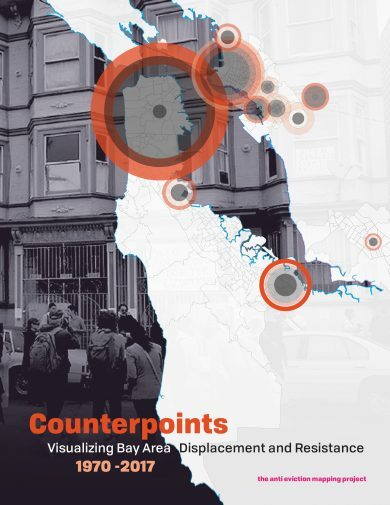 This event will feature members of the Anti-Eviction Mapping Project will be offering a preview of their new atlas manuscript, Counterpoints: Bay Area Data and Stories for Resisting Displacement, which will be released by PM Press in the spring of 2020. The Anti-Eviction Mapping Project (AEMP) is a data visualization, digital cartography, and multimedia collective based in the San Francisco Bay Area. The project aims to inform, empower, and activate communities impacted by housing inequity and displacement, supporting the work of collectives fighting for housing justice. By excavating and creating pertinent data, narratives, and maps, the AEMP reorients and repositions power in the community and in the hands of those who are working to restore housing equity in low-income communities and communities of color. Bringing together artists, activists, oral historians, cartographers, muralists, and more, AEMP is rooted in the idea that community-based knowledge production is essential in fighting displacement. While AEMP has produced hundreds of online interactive maps and oral histories, numerous videos and reports, and even several murals, light projections, zines, and posters, over the last year the project has launched into a new cartographic endeavor. Counterpoints brings together dozens of artists, activists, designers, and cartographers to produce a manuscript-length series of maps, graphics, poems, and text. Content is divided into seven chapters, including: Migration and Relocation; Indigenous Geographies; Evictions and Root Shock; Public Health and Environmental Racism; Financial Speculation and Speculative Futures; Carcerality and Abolition; and Transportation, Infrastructure, and Economy. Counterpoints encompasses geographies ranging from Vallejo to Santa Cruz in an effort to tell a regional story of gentrification, particularly as it is racialized and classed. Different project members are editing and producing original visual content for each chapter, and also working with numerous new community and partners and contributors, thereby expanding the existing scope of AEMP’s work. In addition to the book, AEMP crafting online interactive content and downloadable educational material, which will be available on the PM Press and AEMP websites.